Those brokers are of course using all the usual twisted marketing tricks to lure imprudent targets investors: giving you a sense of urge, asking you obvious question just to keep you interested, reminding you about a meeting you supposedly had a few month ago… classic crooked sale techniques, but nothing specific to financial products sales. Keep them in mind nonetheless. Don’t get me wrong I hate those cheap tricks, lies. I despise the guys using them and often rage on the phone against them when they try to target me. However those tricks are not specific to financial products sales. But there actually exist specific investment selling traps, strategies, and those brokers use them all the time. And those are the one I want to expose here for potential investors, for their own sake. 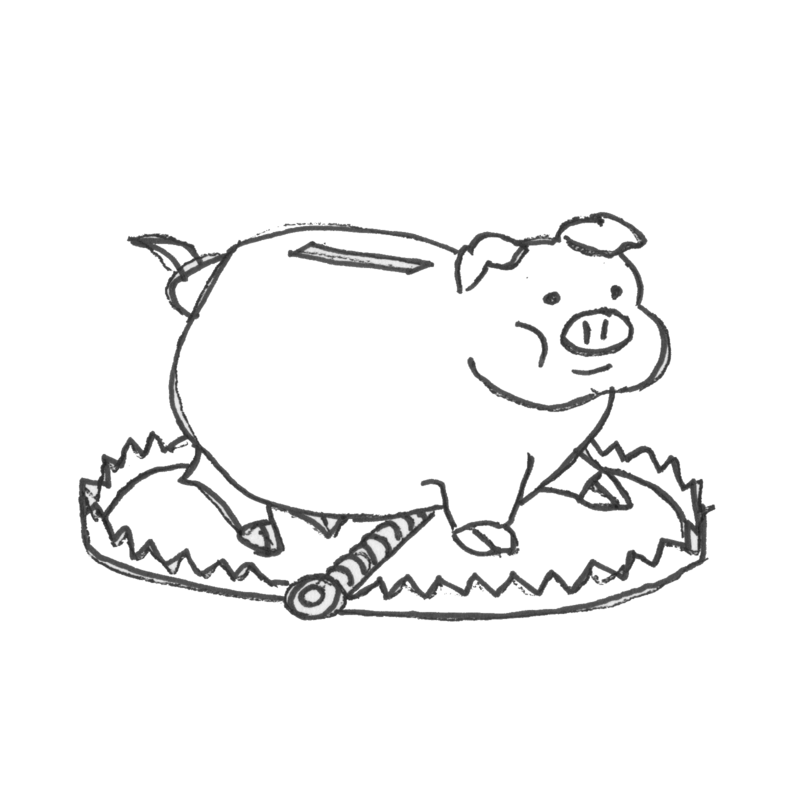 THE TRAP : They offer an immediate and very savory tax break to attract you into a bad deal. They use the natural reluctance you have to pay taxes and offer you not a good investment, but a way *not* to pay taxes. The actual investment comes second, and is usually very bad. The objective is not to make a sound financial decision but is simply to satisfy your fear of paying something right now instead of later. Oh, and by the way, they always omit to tell you that in most cases you will actually pay those taxes… but later, when they are long gone. Those are just differed taxes. Their fees however are not, they are upfront, and heavy. AVOIDING IT : Stay overly suspicious about any kind of investment that embeds any kind of tax break. When offered one, always do your homework and compare this fiscal gain with the cost of it, which is done by finding an investment that has the closest exposition to it but with no tax break and comparing them. THE TRAP : They show off amazingly good returns, and forget about the risks. The best way to do this is to take an allready overly optimistic average return of a product and multiply it by a large number of years : “LOOK at this : if you buy our +10% a year product you might make over +100 % in 8 years !”. Okay but they forget to tell you that waaaayyyy before that you are very likely to loose everything or simply to get out in panic because you got scared after the investment fell 50%. Oh and they also forget to tell you that they will get a huge amount of money out of it in the meantime, they are not bearing any investment risk, you are. AVOIDING IT : Never ever forget that every share of additional return costs an extra share of risk. To remind you the basics : if it is too good to be true, it probably isn’t. So don’t get too excited about excessive *expected* returns. THE TRAP : This one is quite tricky. That the point: you not understanding it. They create products where they separate the two components of risk to lure you. Investment risk can indeed be scaled according two dimensions: the risk’s probability (the chance of the bad stuff actually happening), and the risk’s gravity (how bad it will hurt you IF it happens). The trick is to sell you high gravity but low probability risk products. Those are mainly structured products including short option positions. With them they can tell you: “don’t worry you are safe, because the worst is not probable”. Yes, but they “forget” to tell you that s***t actually happens, and a more often than you think, and that they won’t refund you when it happens. In fact those products are the real world, mathematically designed version of the long known financial broker saying : “If it goes up I win, if it goes down you lose”. AVOIDING IT : Options and optional products are very hard to understand and you should avoid them. They might be useful in very, very specific situations but if you don’t perfectly understand a product, avoid it. THE TRAP : They make you invest in very illiquid stuff for a long maturity with no compensation for it. For those who don’t know it yet, illiquidity has a price in finance, and you should be paid for it. An investment that can only be sold in 6 years and with a high transaction cost is supposed to earn a higher return than an identical one that is not. Even if they correctly price this risk, are you really sure that you won’t need your money before the end ? Is this really suited for you ? AVOIDING IT : Always ask yourself how quickly, and how expensive it will be, for you to get out if you need or want to. If you are not able to assess this properly, it is better for you not to invest. You must also always measure the premium you get from illiquidity, with the same method as with tax breaks : compare the product with a similar one with perfect liquidity. THE TRAP : They push products that are not exchanged, and priced, on a regular basis. Therefore they argue that those products have no risk because they have no price volatility. This is not true : not been able to measure volatility does not mean there is none ! AVOIDING IT : To repeat myself, EVERY investment has risks proportional to its potential returns. Investments not traded on a regular basis are very common, and might actually be good investments, but do not assume they they are not risky because their price doesn’t seem to vary. And keep in mind that price volatility is not the only risk that you bear in an investment. THE TRAP : They try very hard to separate in your mind the very large upfront they are taking from the sale from the return you will compute on your investment. This way they might be able to trick you into thinking “I paid a high price for it, but now I own a great investment”. No no no, it is not a great investment if you paid too much for it in the first place ! AVOIDING IT : Always include all the fees/cashflows you are paying, including marginal tax paid, and upfront fees, in the computation of the return of your potential investments and analysis of their quality. Also always include all ongoing charges and compute returns net of them. THE TRAP : They sell you an investment that you can brag about. They want to sell you an investment story, and this is actually a quite textbook financial industry strategy which is called “sell a narrative”. They want you to be able to use it and tell your friends at socials how smart your last investment was. Oh and they do expect that your friend or cousin will get interested and ask for it too. Those might be confidential small cap equity, limited access real estate funds, for bigger clients, private equity. Well anything that make you feel like a “great, unique investor”. AVOIDING IT : do not ever talk about your investments in public. That should be taboo as a subject because talking about it might only have two consequences. First, you felling bad about the fact that you did not invest like your sister’s husband in the great cryptocurrency he made so much money with (he actually did not). Second, and even worse, driving you into making bad investment decisions based on narratives and not facts. Keep your investments success for yourselves and remember this : people only talk about investment when they think it will be a success, never when they got hit, so don’t worry about your sister’s husband. THE TRAP : They try to make you feel important and sell you the pride and not the investment. That is the main selling strategy of private banking. They receive you in secluded and sound proofed offices, invite you to private economic outlooks or selective social events, and make you feel richer. You have access to a private banker and to the “full resources of the bank”. And they make you pay for all of this with subpar, and very expensive investment products. AVOIDING IT : I would say, first of all, avoid, or get out now of private banks. That is the simplest and more effective advise. Second be aware that you are paying for the nice stuff, posh office, cocktails, speakers. Finally, try to get rid of anything that could alter your judgment and make you make bad investment decisions. That’s it for now. I have of course missed some of their tricks but I hope that this starter list of 101 investment selling traps will help you make better investment decisions. Keep in mind that if they are not fiduciaries, i.e. they are making money on selling you products and not direct and unbiased advise, you should be overly prudent with what they push towards you whatever the method or product they use to get to it. Next Next post: Artificial intelligence, what can a video game tell us ?